St. Athanasius, known as the "champion of orthodoxy," was born about the year 297, in Alexandria. There is a tradition, related by Rufinus, that he first attracted the notice of Patriarch Alexander as he was playing at baptism on the seashore with other small boys. After watching young Athanasius perform the rite, the prelate called the boys to him and by questioning satisfied himself that the baptisms were valid. He then undertook to have these boys trained for the priesthood. Athanasius received an excellent education, not only in Christian doctrine, but also in Greek literature and philosophy, rhetoric, and jurisprudence. He knew the Scriptures thoroughly, and learned theology from teachers who had been confessors during the terrible persecutions under Maximian. In youth he appears to have formed friendships with several hermits of the desert, especially with the great Antony, whose biography he was to write. He was reader to the patriarch, and in 318 became his secretary. During this period he wrote a discourse, <Against the Gentiles>, in which he attempted an explanation of the Incarnation and the doctrine of the Trinity. In Egypt two strong and often divergent forces had early appeared in the Christian Church: the conservative hierarchy in Alexandria, represented by the patriarch or bishop, and the theologians of the schools, who cared little for tradition and stood for free reasoning on theological subjects. The leaders of the latter party had sometimes been obliged, like the famous Origen, to go into exile. There were also schisms over the distribution of authority in the Church and over doctrinal questions. It was probably about the year 323 that one Arius, a priest of the church of Baucalis, began to teach that Jesus, though more than man, was not eternal God, that he was created in time by the Eternal Father, and could therefore be described only figuratively as the Son of God. The patriarch demanded a written statement of these doctrines. With only two dissenting voices the bishops condemned them as heresy, and deposed Arius, together with eleven priests and deacons of Alexandria. Arius retired to Caesarea, where he continued to propagate his ideas, enlisting the support of Bishop Eusebius of Nicomedia and other Syrian prelates. In Egypt he had already won over many of the metaphysicians, as well as Meletius, bishop of Lycopolis, and leader of a dissident group. Theology being the topic which most deeply engaged men's minds, the Arian controversy interested all classes of the population. The heretical propositions were publicized in the form of songs set to popular tunes, and these were chanted in the forums and carried by sailors from port to port. Athanasius, as the patriarch's secretary, took a prominent part in this great Church struggle. It is probable that he even composed the encyclical letter announcing the condemnation of Arius. We know that he was present, as an attendant on Alexander, at the famous Council of Nicaea, summoned by the Emperor Constantine to determine matters of dogma. There the sentence against Arius was confirmed, and the confession of faith known as the Nicene Creed promulgated and subscribed. This gathering of churchmen influenced Athanasius deeply, and, as a modern writer has said, the rest of his life was a testimony to the divinity of the Saviour. Shortly after this Alexander died, and Athanasius succeeded him, although he was not yet thirty. One of his first acts was a tour of his enormous diocese, which included the great monastic settlements, especially the Thebaid. He ordained a bishop for Abyssinia, where the Christian faith had recently been established. Yet in spite of his best efforts, there was strong opposition. The Meletians made common cause with the Arians, and the movement, temporarily discredited by the Council of Nicaea, was soon again rampant in Asia Minor and Egypt. In 330 the Arian bishop of Nicomedia, Eusebius, returned from his exile and before long had persuaded the aging Constantine to write to Athanasius, bidding him readmit Arius into communion, in the interests of unity. Eusebius sent an ingratiating letter in defense of Arius, but Athanasius held to his conviction that the Church could have no communion with heretics who attacked the divinity of Christ. Then Eusebius wrote the Egyptian Meletians urging them to impeach Athanasius for personal misconduct. They brought charges that he had levied a general tribute of linen for use in his own church, and made other petty accusations. At his trial before the emperor, Athanasius cleared himself and returned in triumph to Alexandria, bearing with him a letter of approval from Constantinople. His enemies now accused him of having murdered a Meletian bishop named Arsenius, and summoned him to attend a council at Caesarea. Knowing that his supposed victim was in hiding, Athanasius ignored the summons. In 335 an order came from Constantinople to appear before another assembly at Tyre, packed by his opponents and presided over by an Arian who had seized the see of Antioch. Realizing that his condemnation had been decided on, Athanasius abruptly left the council and took ship for Constantinople. There he accosted the emperor as a suppliant in the street and obtained an interview. So completely did he vindicate himself that Constantine summoned the bishops to Constantinople for a retrial of the case. Then, for some unexplained reason, he suddenly changed his mind. Before the first letter arrived, a second was sent, confirming the sentence and banishing Athanasius to Treves. During this first exile, Athanasius kept in touch with his flock by letter. In 337 Constantine died, shortly after his baptism by Eusebius of Nicomedia, and his empire was divided among his three sons, Constantine II, Constantius, and Constans. Many of the exiled prelates were now recalled. One of the first acts of Constantine II, who had sovereignty over Britain, Spain, and Gaul, was to allow Athanasius to return to his see. Two years later Constantine II was to be killed in battle in Aquileia. The patriarch reentered Alexandria in seeming triumph, but his enemies were as relentless as ever, and Eusebius of Nicomedia had completely won over the Emperor Constantius, within whose portion of the empire Alexandria was situated. New scandals were invented and Athanasius was now accused of raising sedition, promoting bloodshed, and keeping for himself corn intended for the poor. A Church council which met at Antioch again deposed him, and ratified an Arian bishop for Alexandria. In the midst of all this confusion a Cappadocian priest named Gregory was forcibly installed as patriarch of Alexandria by the city prefect, pagans and Arians having now joined forces against the Catholics. Confronted unceasingly by acts of violence and sacrilege, Athanasius betook himself to Rome to await the hearing of his case by the Pope. A synod was summoned, but the Eusebians who had proposed it failed to appear. The result was a complete vindication of Athanasius, a verdict afterwards endorsed by the Council of Sardica. Nevertheless he found it impossible to return to Alexandria until after the death of Gregory, and then only because Emperor Constantius, on the eve of a war with Persia, thought it politic to propitiate his brother Constans by restoring Athanasius to his see. After an absence then of eight years, Athanasius was welcomed back to Alexandria in 346, and for three or four years there was comparative peace. But the murder of Constans in 350 removed the most powerful support of orthodoxy, and Constantius, once he found himself ruler of both West and East, set himself to crush the man he now regarded as a personal enemy. At Arles in 353 he obtained the condemnation of Athanasius from a council of Gallic bishops, who seem to have been kept in ignorance of the importance of the issues. Two years later at Milan he met with more opposition from the Italian bishops, but when with his hand on his sword he gave them their choice between condemnation of Athanasius and exile, by far the greater number yielded. The few stubborn bishops were exiled, including the new Pope Liberius. He was sent into isolation in Thrace until, broken in body and spirit, he too gave his consent to the Arian decrees. Athanasius held on for another year with the support of his own clergy and people. Then one night, as he was celebrating a vigil in the church of St. Thomas, soldiers broke in. Athanasius was instantly surrounded by his people, who swept him out into the safety of darkness; but for six years thereafter he had to live in hiding. His abounding energy now expressed itself in literary composition, and to this period are ascribed his chief writings, including a <History of the Arians>, three letters to Serapion, a defense of his position to Constantius, and a treatise on the synods of Rimini and Seleucia. The death of Constantius in 361 was followed by another shift in the situation. The new emperor, Julian, a pagan, revoked the sentences of banishment enacted by his predecessors, and Athanasius returned once again to his own city. But it was only for a few months. Julian's plans for a reconquest of the Christian world could make little headway as long as the champion of the Catholic faith ruled in Egypt; he also considered it necessary to banish Athanasius from Alexandria as "a disturber of the peace and an enemy of the gods." During this fourth exile, he seems to have explored the entire Thebaid. He was in Antinopolis when two hermits informed him of the death of Julian, who, it was later ascertained, at that moment was expiring in distant Persia, slain by an enemy's arrow. The new emperor, Jovian, a soldier of Catholic sympathies, revoked the sentence of banishment and invited Athanasius to Antioch, to expound the doctrine of the Trinity. Jovian's reign lasted only a year, and his successor in the East, Valens, succumbed to Arian pressure in Constantinople and in May, 365, issued an order banishing again all orthodox bishops who had been exiled by Constantius and restored by his successors. Once more the worn and aged prelate was forced to flee. The ecclesiastical historian, Socrates, tells us that Athanasius hid himself this time in his father's tomb, but a better- informed writer says that he spent the months in a villa in a suburb of Alexandria. Four months later Valens revoked his edict, fearing possibly a rising of the Egyptians, who were determined to accept no other man as bishop. Joyfully they escorted him back. Athanasius had spent seventeen years in exile, but his last years were peaceful. He died in Alexandria on May 2, 373. His body was twice removed, first to Constantinople, and then to Venice. 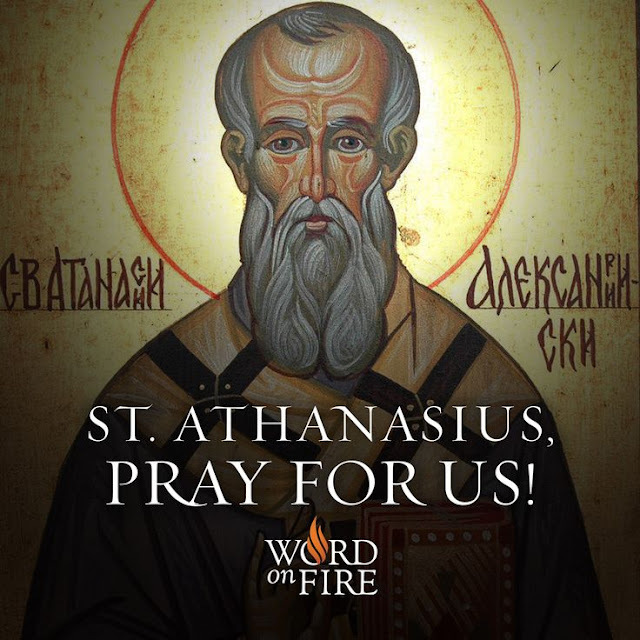 While the theological controversies which marked this period may seem both complex and remote, they were an important milestone in the history of the Church, Athanasius rendering an outstanding service. The statement of Christian doctrine known as the Athanasian Creed was probably composed during his life, but not actually by him. In his works there is deep spiritual feeling and understanding, and as Cardinal Newman said, he stands as "a principal instrument after the Apostles by which the sacred truths of Christianity have been conveyed and secured to the world."